Those People-of-Allah, who are the Kaamil Faqeers, they are not free from the day and night Inwardly training and education and teaching and fostering the Seekers and they cannot sleep even of a moment in day or night. They are, like, gardener and cultivator, who all the time water their nursery and take care of their cleanliness and growth. 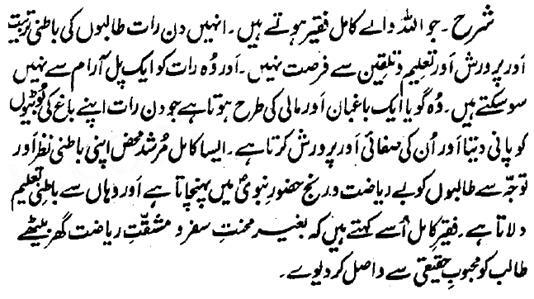 Such Murshid-e-Kaamil takes the Seekers to the Hazoor of the Prophet just through his Inwardly Gaze and Tawajuh without subjecting them to any exertion or hardship and grants them Inwardly Teaching form there. He is called the Kaamil Faqeer, who makes the Seeker Waasil with the Real beloved without putting him in effort of journey and hardship of Riyazat.